‘Management is doing things right; leadership is doing the right thing’. Love that one. Peter F. Druker. So leadership is about choice. Selecting from the infinite possible futures the one that helps to achieve whatever is closest to your heart. Whenever we make a decision, large or small, we like to have as much relevant information as possible to aid us. Leaders build up their understanding of the world to help them make the best decisions they can. ‘The function of leadership is to produce more leaders, not more followers’. That one is Ralph Nader. So leadership is about sharing. Sharing the future, sharing information, sharing responsibility and sharing the understanding that makes a leader in the first place. It’s about inspiring people to learn, know and do things they otherwise wouldn’t. ‘Leadership and learning are indispensable to each other’. So learning is key to leadership. It’s about fathoming out the safest, fastest, surest, (insert your adjective of choice here) way into the future. Now, we can’t know the future. Not yet – see what I did there? The next best thing is to arm yourself with as much information about the present and the past as possible and infer potential outcomes of the various ways forward. Then it’s basically like chemotaxis. Move towards the good stuff. So to our final and most pertinent quote for today from Harry S. Truman. This one is close to my heart as an author. Here are five reasons why I think this makes sense. When we read we multiply our own experiences by those of others – Most things in life that are worthwhile take time. We experience life one moment at a time and are limited to experiencing and learning what we can as we go. Reading allows us access to the experiences of others and at a much faster rate than a measly one moment at a time. When we read we can choose who we spend time with – You are the sum of the six people you spend most time with. Apparently. Not verified or anything but is seems to make some sense. Spend time with smart people and you’ll be smarter and so on. You might never meet your heroes or those that know about something you are interested in, but you can read and re-read their words as often as you like. It’s a bit like time travel albeit into the past. When we read we receive considered wisdom – Unless you are reading the comments on (any site you like) or much written on social media, a good book will represent the author’s considered thoughts and analysis about the subject, not just experiential data. That saves you the job of interpreting the data yourself and trying to put it in an order that makes sense. Authors often do that for you too. When we read we transcend the day to day – Getting the kids to school, looking after the pets, fitting in some exercise, remembering to eat well, oh and actually doing the work people pay you for is enough to cause the days to blend into one. Reading allows us to step back and look at things from a broader perspective. Things often look better from there. When we read we escape – Leaders often like to read things about leadership. Naturally. However, many enlightened people understand that reading widely and deeply outside of your (current) area of interest is very productive and can give you the next idea you never knew you had in you. It also allows you to journey beyond to other realms – doesn’t have to be time travel. Just a literary device. With all of the above in mind I have sought to follow Druker, Nader, Kennedy and Truman and suggest that you read The Pharmacy Marketing Formulary. You can buy a copy by clicking ‘Add to basket’ below. It is the right thing as Druker points out. Pharmacists and their teams need to understand marketing better. It is known. Sharing the knowledge and experience I have in pharmacy and marketing will help you become pharmacy marketing leaders yourself. I’m sure Nader would approve. The Pharmacy Marketing Formulary is full of information that may be new to you. Kennedy would like that you are learning. Finally, well, almost, Truman would wholeheartedly compel you to read if you want to lead. Lead in your own community, in your region, your profession, your country. Whichever arena in which you choose to carve out a new and better future. I’ll leave you with a final quote from possibly the most influential of thinkers in recent decades. He has something useful to say about getting better at pharmacy marketing and buying a copy of The Pharmacy Marketing Formulary. ‘Try not. Do or do not. There is no try’. If you’d like to stay in touch and receive the odd update you can subscribe here. Looking forward to hearing from you. Professions change and adapt as the years go by. At this time of uncertainty and rapid development within the pharmacy profession, it seems more important than ever that we can fully and collectively articulate exactly what a pharmacist is. Not just for ourselves but also, more importantly, for our stakeholders. Without a clear idea in our mind we will struggle to convince patients, commissioners and politicians of our value and the contribution that we make. With the ever expanding role of the pharmacist there is more than one answer to the question, or at least there is more than one facet to the answer. Never before has there been so much opportunity for pharmacists to work in a range of settings, as part of widely differing teams or to specialise in so many ways. These opportunities herald a great future for the profession. They also present a challenge when we seek to describe, in a way that anyone can understand, what a pharmacist is. The answer is becoming more complex and we are predisposed to ever increasing complexity. We are naturally inclined to focus on detail and accuracy. Capturing what is common amongst pharmacists irrespective of setting or specialism is an important step towards being able to communicate that coherently and consistently to society. While the specific contribution of pharmacists working in different settings and specialisms is distinct and important to us, we may find that it is less important to our stakeholders. Brand owners often apportion a much higher level of importance to their brand than their customers. Of course they do. They think about it day in day out. However, to customers it’s often a small part of their world. Important perhaps, small definitely. The brand of pharmacists is no different. To us the intricacies of our differences seem vitally important. To others they are less so. We are much better seeking to understand what is common to the idea of a pharmacist, what underpins our value and focus on communicating that in a way that any member of our family could grasp. This is a critical point. To win over the public to our view of what a pharmacist is and can do we need to be able express what that is in a way that anyone can understand. That precludes highly detailed, technical descriptions and requires us to use the right kind of language and concepts that resonate with everyone in society. A short look at data from the National Literacy Trust and this becomes clear. It may be stating the obvious however it is the view of most people within the profession that others don’t understand what pharmacists do. They don’t value us highly enough. They don’t commission us enough and they don’t pay us enough. This appears to be the broad consensus and we are and have been striving to redress this balance for a long time. Value, commissioning and payment all stem from an understanding of what we are and what we can do to help. At present there may be a gap between what the public, and I include commissioners and politicians in this group, think of pharmacists and what pharmacists think of themselves. The challenge is that no one person has the answer to the question ‘What is a pharmacist?’ We as pharmacists have many answers, some of which relate to what we are now and some of which relate to what we can be and aspire to be in the future. Our patients have a whole range of answers themselves based on their current experience. To this end a research project is underway that seeks to understand how people from differing stakeholder groups would describe a pharmacist. How they would answer the simple question ‘What is a pharmacist?’ By gathering and analysing the thoughts of as many people as possible the hope is to shed some light on brand pharmacist and facilitate work to manage that brand. Results and analysis will be published as part of a forthcoming book from DOSE Publishing. With responses from ten different countries and a significant interest from members of the public the quantum of data is growing. Responses are sought from pharmacists of all types, pharmacy team members, a wide range of healthcare professionals and members of the public. An edited version of this article appeared on The Pharmaceutical Journal website in February 2019. Contribute to the research with your description of a pharmacist here. So it is with great pride that we tell you that The Pharmacy Marketing Formulary has been reviewed by the Pharmaceutical Journal. The review itself was completed by Rod Tucker, a pharmacist researcher and visiting research fellow, Robert Gordon University, Aberdeen, UK. We had the pleasure to present an overview of the Pharmacy Marketing Formulary at this years Pharmacy Show event in the NEC Birmingham. It was another blockbuster event attended by 000’s of pharmacy people and supported by 000’s of exhibitors. It was an honour to speak and share the ideas in the PMF with an engaged audience who didn’t ask many questions but many of whom did come and see us on our stand shortly after the show to purchase a copy of the book and ask some marketing related questions. We thought we’d share the presentation we delivered with you so that you can enjoy the same overview. Sadly you won’t be able to get the full, immersive experience and hear the wonderful commentary by Gavin, the author of the Pharmacy Marketing Formulary, but it should still give you a hint as to the wonderful content of the PMF. 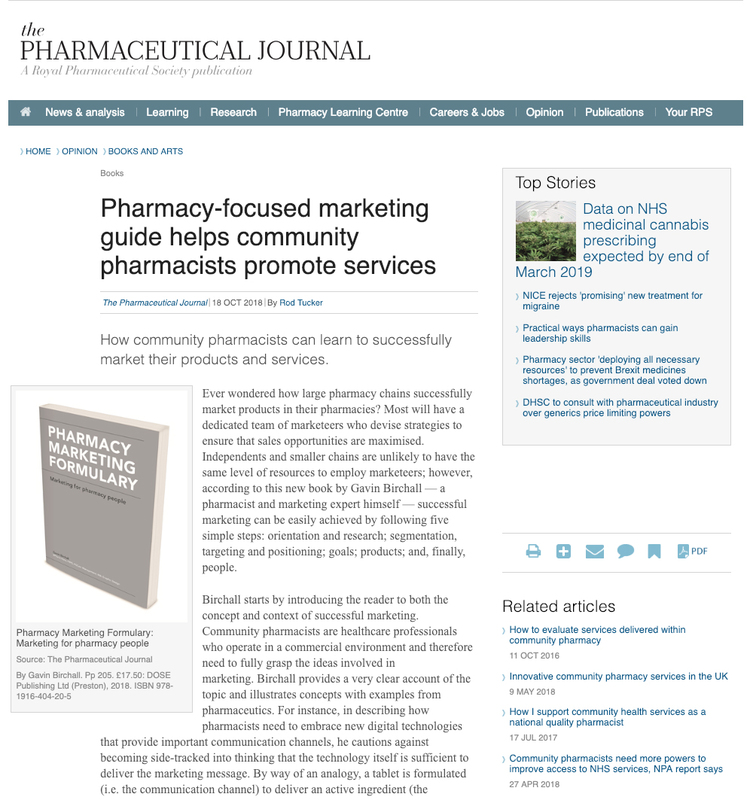 Following the successful launch of our first book, the Pharmacy Marketing Formulary (PMF) I am really excited to begin work on our next publication. 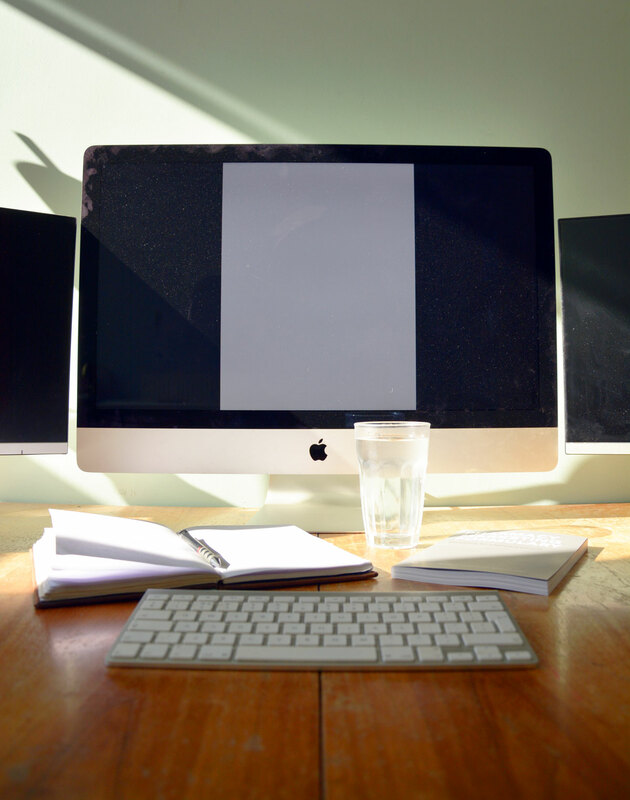 For many the fear of a blank page is overwhelming and can be too much to bear. Luckily the first book published by DOSE Publishing was the second book I wrote if you get my drift. I am starting on our next publication with a clear idea of what I want to produce and a lot of material to work with. That makes it a whole lot easier than actually starting with the dreaded blank page. That said it isn’t exactly easy. This time I know what is ahead, how much work is involved and how much energy it will take! However I am confident about the material so here are some of the tips I’ve gathered to help overcome the inertia when getting started on a new work. Write: Sounds simple and it is but it can be the hardest step to take. If you want to be a writer you have to write. Thinking about writing will not get anything done. Writing will. Write. Suspend judgement: It doesn’t have to be perfect first time. If you set yourself too high a bar in terms of what you write in your first draft it may well lead to not writing at all which we know from tip one is key. You will inevitably come back, review and re-write what you have written a number of times. Be disciplined: Longer works of writing take time to produce. There is a limit to how quickly you can get your thoughts down so anything that is approaching a well considered book will take months to write. Don’t rush. Set yourself a target for writing each day. It can be an amount of time, a number or words, a chapter or something else. Then stick to it come hell or high-water. You will find that before long you have something worth reviewing. Stream your consciousness: If you are really stuck just write anything you can about the project you are working on. Describe it. Where you are up to. What the next steps are. Anything to get you moving. For extreme cases write whatever is in your mind irrespective of whether it relates to your project or not. You could, for example write a blog about starting your next book and overcoming the blank page. Know when to stop: The blank page isn’t just there on day one of a project. It is there every time you sit down to write. Ernest Hemingway had a failsafe way to tackle this. He’d stop writing each day when he knew what he was going to write next. That way he’d know where to start when he sat down the following day. Which means he could always just write and brings us back to tip one. I hope these tips were useful and get you writing. Johnathan Laird is a progressive talent in the pharmacy profession leading with passion and connecting people to advance the work of pharmacists. He is editor of Pharmacy In Practice, a pharmacy news publication focusing on the work of pharmacists North of the border, a general practice pharmacist, a member of the Royal Pharmaceutical Society Scottish Pharmacy Board and Co-ordinator and Administrator of @WePharmacists on Twitter. Busy man! ‘The Pharmacy Marketing Formulary (PMF) is a very important modern textbook for anyone working in the pharmacy business. I found the book very relevant and engaging. Gavin takes a simple five-step approach to assimilate and explain many of the core marketing concepts in business. He has cleverly moulded these five steps around the priorities of a busy community pharmacy.